A Court of Thorns and Roses was the first book I read as soon as my semestral break started. 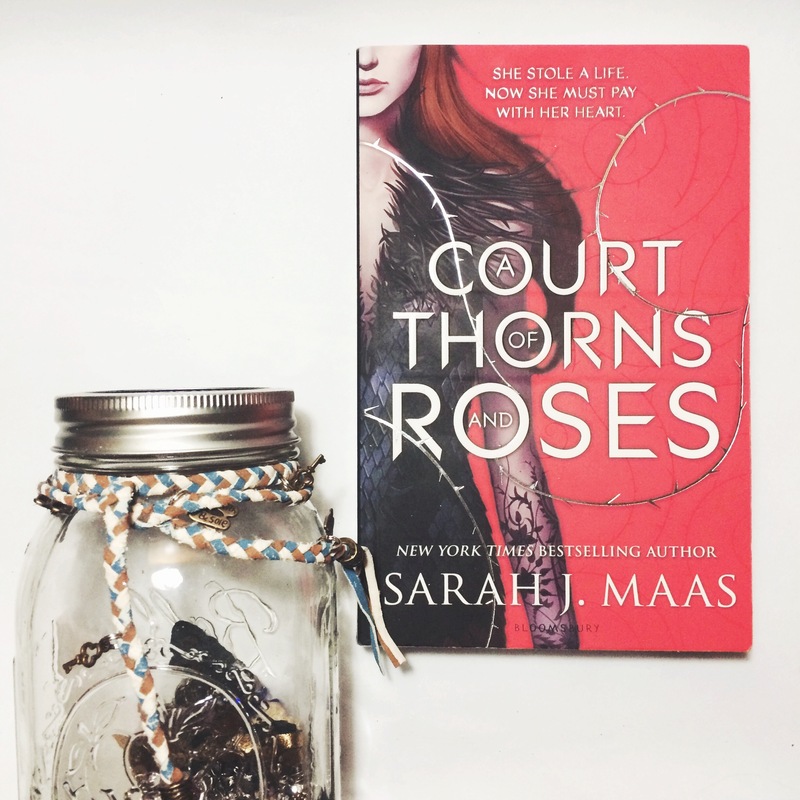 This is also the first Sarah J. Maas book I read and I knew I was up for a very beautiful and magnificent ride, since Sarah J. Maas is among the famed authors of today due to her well-written fantasy novels. The story started out slow, with Feyre having the need to hunt for her family’s survival. This part of the novel was just like any other young adult novel, like I was reading through Katniss Everdeen’s eyes, then there came the wolf she needed to kill. The world Sarah created was beautiful and terrifying at the same time. It was very unique and interesting, and as some questions were answered, more were even asked for the continuation of the series to answer. The different Courts were extraordinary, the monsters spine-chilling, and the characters somewhat both amusing and stubborn, which made them even more lovable. It was only in this book where I was able to read these kinds of things, and these are the things that makes this book different from others. I highly recommend this book to those who love high fantasy and new adult novels, and those who like Red Queen. Sarah built the world slowly but surely, not leaving any important information so that all else may be established. Because of the slow pace of the story, it became kind of dragging for me in the middle, like there was nothing happening. There were about 250 pages before the climax was reached, and before action happened. And in those pages, I just came to realize that in random moments, I was holding my breath. Perhaps due to the intensity of the scenes? Feyre as a main protagonist, like every heroine in their own story, is very strong-willed. She shows to everyone that she should never be underestimated, although at times she could be somewhat annoying, especially when she couldn’t follow simple orders given to her, but then that disobedience of hers was the reason why Prithian survived. She turned her shortcoming into her strength and I really loved her as a character for it. Tamlin, as Feyre’s lover, was sort of boring. Yes, I loved him as a character, and I really want him and Feyre to be together in the end, and live happily ever after, but there was just so little of his character in the story. It’s like the real him isn’t really showed yet, and it’s as if he was just acting like some plain and cliche guy in a very fantastic story. Perhaps I just didn’t see an edge in his character, which is what I wish to see in the next book. Lucien, on the other hand, was really adorable. He is a really awesome side character that always lightens the mood when everything is just turning dark. I think Feyre even got more help from him than she ever got from Tamlin and honestly, I think he’s the only character in this book I found pure and sincere in what he does for Feyre. Another character who I really found intriguing from the story is Rhysand. Equally annoying and endearing, I never actually thought I’d like him in the end. I thought he was the bad guy but it turns out he’s not. As one of the High Lords, he wants his kin to be saved, he wants Prithian to be saved. I found his character to have an edge among others, actually. And like Lucien he helped Feyre a lot, especially as she went through her trials, which I think was really pleasing. I hope to get more of them in ‘A Court of Mist and Fury’. As for Feyre’s family, the one person I never expected would be of the greatest significance and help was Nesta. She loved Feyre very much and I was amazed at how she has kept it to herself. I loved Elain’s bubbly personality, however I was really not impressed with their father. Amarantha proved to be an effective antagonist. She really got into my nerves as I read scenes with her included. She was really evil and heart-wretched, and proved to be an enormous challenge for Feyre to face. I found the trials very impressive and imaginative. They effectively showcased Feyre’s horrors and shortcomings, and also showed that she can efficiently conquer them, except for the second one where she got a little help from Rhys. When she was turned into one of the High Fae, I got really mixed feelings. I found it sad that she wasn’t given a choice, but also okay because she has been given another life in exchange for what she did for Prithian. I would have loved to see the challenge on love between a High Fae and a mortal, but then, I’m still grateful that Feyre was given another shot in life. Overall, I found the story to be really gripping and very different from other fantasy novels. It gave justice to its retelling of ‘Beauty and the Beast’ and I really loved the masks that the Spring Court wore as a part of their curse, like the servants in the Beast’s manor were all turned into furniture. The way the story was told was really good, and I can’t wait for May 2016 to come, so I can read ACOMAF.